Home › Advice › Why do motorways almost always pass under other roads? When you drive along a motorway you’ll find that most other roads pass over the top of the motorway and there are a few good reasons for this. It is easier and cheaper to build a longer two-lane bridge than a shorter six-lane bridge. A six-lane bridge requires more reinforcing, and the approach to the bridge would require earthworks that are three times the scale to raise the motorway. It is simpler and cheaper to dig down slightly for the motorway and raise the other road’s bridge slightly. For maintenance purposes, maintaining a two-lane bridge is less complex than a six-lane bridge. A six-lane bridge creates a large shaded area that would require lighting at night, and possibly during the day, increasing electricity costs. 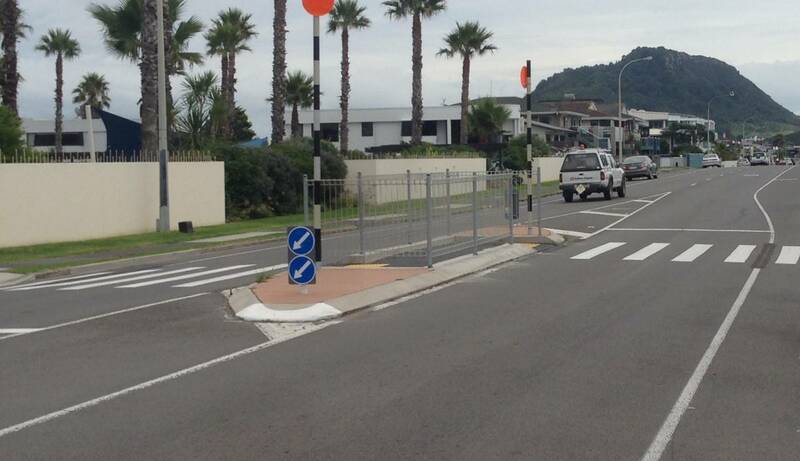 Pedestrians may not feel as safe, too. 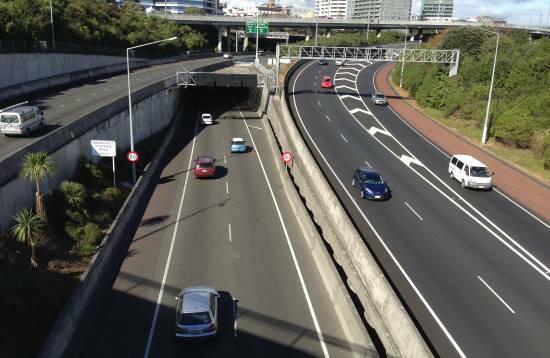 The photo below shows the view from Wellington Street in Auckland over SH1 towards Hopetoun Street. To put a road underneath these would require more complex engineering. When the motorway is lower than the off-ramp, the uphill on the exit assists vehicles in slowing down. The on-ramp will also be sloped down towards the motorway, enabling vehicles to get up to speed quicker, and give them a better view of the traffic on the motorway to allow for safer entry. Crests cause blind spots. If a motorway had to rise and fall over a bridge it would create an unnecessary hill with a blind spot on the other side. Bridges over motorways allow for signage without having to erect separate sign gantries. The photo above shows signage on on the Hopetoun St bridge. Great North Road passes under SH16 at the Waterview on-ramp. This is a complex intersection and the motorway’s gradient is built to fall gradually towards the causeway heading towards Te Atatu. Broadway Newmarket passes under SH1 South due to the Newmarket Viaduct.